Driving faster than he probably had to down the pot hole-puddled two-track, he was racing nobody but the sun. Anxious to be at the launch before dawn, he was relieved to find the parking area empty, allowing him to relax his pace. With the fog still holding close to the earth, he was the first one there this morning; though he knew full well that he wouldn’t have the river to himself much longer. At least there was the solace of knowing that others will be well behind him; out of sight, out of earshot, out of mind. But this is the Pere Marquette – a world-class fish factory. A river of notoriety. A river that draws the attention of every rabid head-hunting angler eager to outwit its broad-shouldered brown trout, rainbow residents, and migrating sea monsters from Lake Michigan. A river which must be shared. His was not a mission of fishing today, but rather pursuit of badly needed escapism. A distraction necessary to fuel the soul of the solitude-seeker. A rare glimpse of wildness and a primitive sense of order, juxtaposed to a modern world that seems to have gone mad. He lives here now. 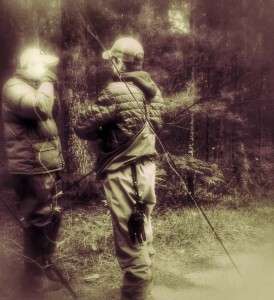 He has many occasions to fly fish the river’s riffles, pocket waters and lumber-laden deep bends. Leaving his fly rod, weathered vest and mildewed waders in the truck was easy today, because his intentions were to slip away to another century. Trying not to disturb the silence with the inevitable clanks, bangs and clunks of clumsily launching a canoe by himself, he was now underway, with every paddle stroke easing him deeper into silent serenity. The sweet, composty stench of the silted river’s edge and the smell of the low-land woods after the night’s rain filled his senses. To him, this was perfume. The low, early sunlight made diamond prisms of dew clinging to the curl-topped ferns. To him, this was art – painted by the hand of God. The familiar ghost-like mist, low on the flat water, suggested a lonely but glowing effect as the current carried his craft around the bend. A startling explosion of a blue heron broke the quietude with the shrill scolding squawk of disapproval. He had invaded another’s peace. With the powerful downward luft of the heron’s weighty wingspan, the river’s mist swirled behind in the airstream. It reminded him of a pterodactyl soaring through rising volcanic ash, lending the whole scenario to seem prehistoric in nature. But this ridiculous fantasy wasn’t really too unrealistic, as relatively little has changed here for centuries. Like other rivers of the Great Lakes Basin, the Pere Marquette River as we know it today was cut by the great torrent floods left in the wake of the last retreating Wisconsinan Glacier some 14,000 years ago. With the historic fluctuations in global weather causing the glaciers to advance and retreat, deposits of glacial drift settled on the bedrock. Rocks, rounded and smoothed by incalculable weight were carried for thousands of miles before settling here. The last of these glaciers disappeared 9,000 years ago. With glacial rebound lifting the land and shaping our beloved Mitten laced with dunes, the water was sent on its downhill course, cutting through the sands of time toward the freshwater sea which is Lake Michigan. The river rocks are time capsules – each one a fossil millions of years old and witness to the river’s formation – and they stay where they lay. Inhabitants who have called the river their home began showing up around 8,000 years ago. While it is known that several cultures resided along the watershed that pre-date the Woodland Period of the last 800 years, little is known about them. Archaeologists agree that evidence of artifacts prove civilizations of Paleo Indians, Copper Indians, and Boreal Indians existed here. About 2100 years ago, the Hopewell Culture, also called the Mound Builders, brought early agriculture to the Lower Peninsula. With Michigan strains of copper found in Mayan artifacts, it’s believed that trade routes were established down the Mississippi, across the gulf, and into Mexico as it’s called today. As it has always been with human nature (and it seems always will be) each predeceasing culture was conquered and wiped out by the following culture, with a few survivors ensconced into the next civilization. We have much to learn about how advanced the Hopewell Indians really were, as they may have been brutally exterminated by the advancement of Indians of the Woodland Period. The Anishinabe People, Algonquian-speaking natives from the East Coast of North America found their way to the Great Lakes region by migrating up the St. Lawrence Seaway about 800 years ago. The “Three Fires”, the Anishinabe federation of Odawan (Ottawa), Potawatomie, and Ojibwan (Chippewa), made this region their home as farmers, hunters and traders. The Odawan people settled largely in the vicinity of the Pere Marquette waterway; a freeway of trade for the day. In the early 17th Century, hundreds were believed to be killed in a massive battle with the invading Mascouten Indians along the Pere Marquette River, near the present day village of Custer. The victorious Ottawa placed the heads of the dead Mascouten on stakes to warn the invaders who called the river “Not-A-Pe-Ka-Gon”, translating into “River With Heads On Sticks”. Brutal testament to brutal times. During the age of European exploration in the 1600’s, the Jesuit Missionaries began spreading their influence around the Great Lakes region. The river’s namesake, Father (Pere) Jacques Marquette explored the waterways connecting the Great Lakes, the Illinois, and Ohio Rivers toward the Mississippi and down to the Gulf of Mexico, establishing trade and peace with the cultures he encountered along the way. He was known to be well liked and highly revered by his native friends. On the long voyage back toward his Mission at St. Ignace in Michigan’s Upper Peninsula, he fell deathly ill and died at the mouth of The River of the Blackrobe (near present day Ludington) now to be called the Pere Marquette River. The region’s interior went largely unexplored until Michigan’s early statehood. The first white settlers began establishing roots, as recent as the 1840’s, along the banks of the Pere Marquette River when expansive stands of towering old-growth White Pine were discovered, then subsequently hacked down to build a growing country. The river was decimated by the booming lumber industry, followed by unregulated sport fishing. 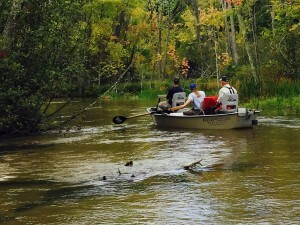 The native Michigan Grayling were over-fished from the river, leaving only a handful of native Brook Trout. By 1900, the Michigan strain of Grayling would be extinct. In 1884, The Pere Marquette River had the distinct honor of being the first river in North America to successfully receive transplanted brown trout from Europe. 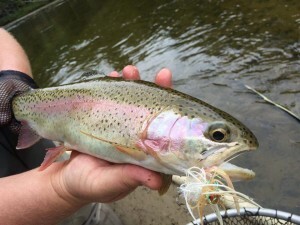 One year later, the Pere Marquette River accepted West Coast Rainbow Trout as well, with some leaving the river to grow immense in Lake Michigan, only to return to spawn and pass along their genes. The Pere Marquette was now host to a magnificent population of Steelhead. Modern regulations continue to ensure the river’s success as a fishery of top reputation. With the sun, now high with a warmth that evaporated the morning’s mist, he continued his voyage down the river. Passing the high banks, crowned with magnificent monarch pine, the river’s grade steepened with increased volume fed by cold-water creeks and sweetwater springs. The ancient glacial rocks of time formed the riffles and rapids which rendered his canoe a scarred veteran from a lifetime of hard use. His destination landing was now coming around the last bend. He was pleased that he encountered no other soul on the water that day – with the exception a rightfully annoyed heron and the wild trout quietly rising to their breakfast along the way. He knows that he exists in his own paradise by the river, close to the trout he loves – but he really arrived once he discovered that he actually loves the river, itself, even more. 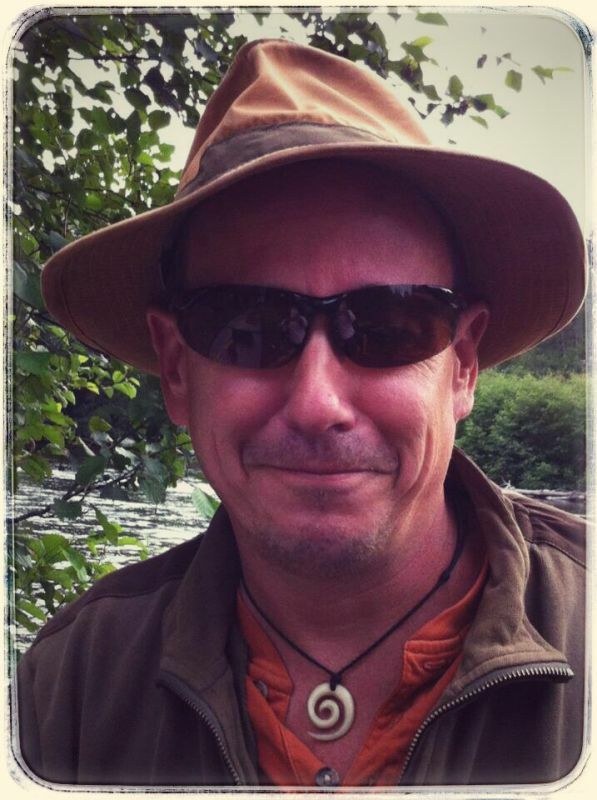 Joe is part of the professional staff at the Pere Marquette River Lodge. He is an award-winning oil painter and fourth-generation fly fisher on the Pere Marquette. He lives in Walhalla, Michigan.